Feriado Tropical? Tropical Holiday? Sounds nice – who doesn’t want one of those? But what if you could have a tropical holiday on seven inch wax? I know! And that’s precisely what you’ll be able to cop from Estonian funk juggernaut Lexsoul Dancemachine come this autumn. How do you like them coconuts? Coincidentally, Coconuts – their equally tropically-flavoured single from last year – is precisely what you’ll find on the flip. 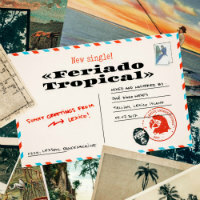 But where that was all frantic Funky Nassau-type percussion and vibraphone stylings, Feriado Tropical arrives with the slap bass rumble of a Caribbean earthquake during a hurricane. Now there’s something to write a postcard home about.